This history-making, UT-AISD Ethnic Studies Summit is taking place on Friday, March 2, 2018, from 5-8:30PM, dinner reception included. Please click here to RSVP. Open to the public, this program aims to inform the community at UT about the first year of the Ethnic Studies roll out in AISD. Ethnic Studies is currently taught in 8 AISD schools and is already showing promising results to which this summit shall speak. 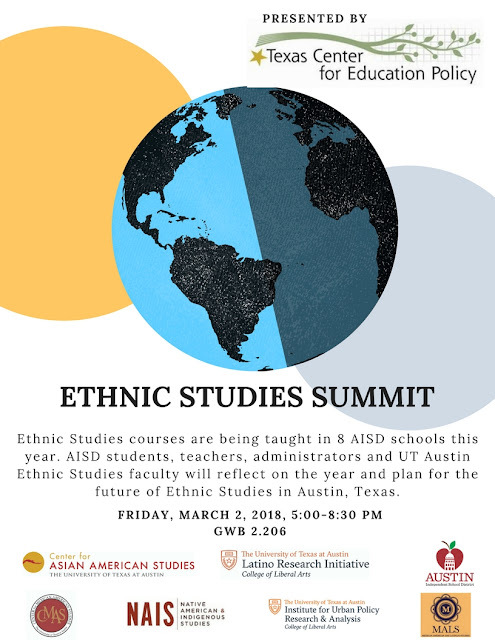 This summit seeks to provide a unique opportunity for Ethnic Studies faculty and students at UT to hear from AISD staff, faculty, and students on their experiences this year with implementing this novel program that plans to extend to all AISD high schools by 2018-19. Special thanks to Lizbeth Lynch in Education Policy and Planning, Sandra Telles Rojas, my Graduate Assistant, and CMAS Operations Manager, Alberto Gonzalez and MALS Events Coordinator Luis V. Guevara for logistical support. So very proud of my UT Cultural Studies in Education doctoral student, Macario Hernandez, for this extraordinary achievement. Mr. Hernandez is principal of Dallas ISD's Trini Garza Early College High School. His early college campus was just recognized by the Texas Education Agency as "one of the nation’s top schools for low-income students." As you can read for yourself below, he was one of two schools statewide that received this recognition. "G-Y-O works! It save lives," he expressed, as a featured speaker at a national Grow Your Own Educator Summit held here in late January in Austin, Texas. As mentioned in this Dallas Morning News article that correctly notes his and the school's philosophical underpinnings in caring relationships, people can indeed work together in unison and improve their children's lives while enhancing the quality of relationships in the larger community, as a whole. Relationship-building, respect, and caring have to reside at the core of one's intention and practice. Keeping schools small also helps. Felicidades, Macario! Congratulations! 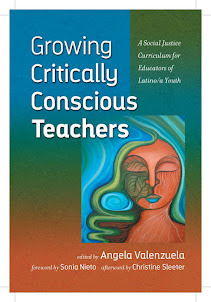 You are the embodiment of the very GYO dispositions that all of our leaders and teachers need to have if we are to be positively oriented in a culturally relevant and attuned manner to the wishes, hopes, and desires of our communities. You have at Trini Garza what every kid on the planet wants. To be cared for, valued, and loved in a culturally relevant, genuine, in-it-for-the-long-haul, way. It's additive, not subtractive. It's about extending students' resources and potentialities rather than about subtracting them, turning on its head the demonstrably wrong-headed project of assimilating youth in a culturally and linguistically eviscerating way. We are all so incredibly proud and happy for you and the many lives that you generously and graciously touch! It is fitting that Macario Hernandez’s office at Dallas ISD’s Trini Garza Early College High School has a window that faces one of the school’s main thoroughfares. If a student or teacher needs a word, it’s easy to flag down Hernandez, the school’s principal, and pop in for a chat. Those connections — built with students, parents and the Oak Cliff community — are what Hernandez points to when asked to describe his campus’ successes. "Relationships are the foundation for everything we do on this campus," he said. "Being able to make a connection with that student, it's profound because you're vested in that student, vested in the community." Located on the Mountain View College campus, Garza was selected by the Texas Education Agency as a National Title I Distinguished School, one of only two schools in the state to receive such a designation for the 2016-17 school year. The other is Houston ISD's charter Project Chrysalis Middle School. For the past three years, Garza has received all seven distinctions — indicators that a school is outperforming its peers — awarded by the TEA. The school’s performance on state assessments across all subjects was double the state’s average last year. When Hernandez spoke to the assembly on Monday, he was quick to remind the audience that they were the engine for the school’s achievements. “This is about you, all the time,” he said. The statement isn’t just puffery. It matches his collective, bottom-up approach to leadership, crafted over a decade as a volunteer community organizer and activist for Dallas Area Interfaith and administrative stops across the district. “To me, this award isn’t about one person or one school,” Hernandez said before the event. “It’s about a community of learners. Relationships we have with students, teachers, parents, relationships we’ve built with the college partner, with the college president — that’s what’s really made us successful at this campus. Outside of that, it’s about valuing the stories and lived experiences of the people who go here. Senior Brandon Leal left the Kimball feeder pattern to apply at the school, intrigued by the dual-credit model that allows students to graduate with a high school diploma and associate’s degree. He’ll head to the University of North Texas in the fall, with 60 college credits under his belt. Leal credited the school’s small size — just 434 students — with fostering a sense of togetherness, with students banding together to help one another meet high expectations of college coursework. This teacher tried to simulate a dictatorship in her classroom. The students crushed her. Here is a great experiment simulating a dictatorship in one teacher's classroom taught annually by Diana Leygerman as part of her George Orwell unit with students' reading of his classic text, Nineteen Eighty-Four—that all of us people of conscience must really read—or re-read—as it is so appropriate to these times. However, this year, the experiment didn't work with Leygerman expressing in the strongest of terms that our generation has a lot to learn from new, powerful voices of young high school students who have well-organized, passionate views on the education to which they are simply entitled, among other things. How encouraging as we think, in particular, about the amazing voices of high school students that are participating in DREAM Act struggles and more recently, gun policy involving youth activists from Florida in the wake of the tragic killings of 17 fellow students there. Despite these difficult and horrific circumstances, this is assuring that the next generation will help to get us back on track in a world that otherwise seems to be spinning out of control. Each year that I teach the book "1984" I turn my classroom into a totalitarian regime under the guise of the "common good." I run a simulation in which I become a dictator. I tell my students that in order to battle "Senioritis," the teachers and admin have adapted an evidence-based strategy, a strategy that has "been implemented in many schools throughout the country and has had immense success." I hang posters with motivational quotes and falsified statistics, and provide a false narrative for the problem that is "Senioritis." I tell the students that in order to help them succeed, I must implement strict classroom rules. They must raise their hand before doing anything at all, even when asking another student for a pencil. They lose points each time they don’t behave as expected. They gain points by reporting other students. If someone breaks the rule and I don’t see it, it’s the responsibility of the other students to let me know. Those students earn bonus points. I tell students that in order for this plan to work they must "trust the process and not question their teachers." This becomes a school-wide effort. The other teachers and admin join in. I’ve done this experiment numerous times, and each year I have similar results. This year, however, was different. This year, a handful of students did fall in line as always. The majority of students, however, rebelled. Photo by Diana Leygerman, used with permission. By day two of the simulation, the students were contacting members of administration, writing letters, and creating protest posters. They were organizing against me and against the admin. They were stomping the hallways, refusing to do as they were told. The president of the Student Government Association, whom I don’t even teach, wrote an email demanding an end to this "program." He wrote that this program is "simply fascism at its worst. Statements such as these are the base of a dictatorship rule, this school, as well as this country cannot and will not fall prey to these totalitarian behaviors. "I did everything in my power to fight their rebellion. I "bribed" the president of the SGA. I "forced" him to publicly "resign." And, yet, the students did not back down. They fought even harder. They were more vigilant. They became more organized. They found a new leader. They were more than ready to fight. They knew they would win in numbers. I ended the experiment two days earlier than I had planned because their rebellion was so strong and overwhelming. For the first time since I’ve done this experiment, the students "won." What I learned is this: Teenagers will be the ones to save us. Just like Emma Gonzalez, the teen activist from Marjory Stoneman Douglas, my students did not back down nor conform. They fought for their rights. They won. Adults can learn a lot from the teens of this generations. Adults are complacent, jaded, and disparaged. Teenagers are ignited, spirited, and take no prisoners. Do not squander their fight. They really are our future. Do not call them entitled. That entitlement is their drive and their passion. Do not get in their way. They will crush you. Foster their rebellion. They are our best allies.